Long 'changing of the guard' ceremony to involve stops in Jerusalem, Tel Aviv - and Gantz's last visit on base in uniform. The IDF will experience a changing of the guard on Monday, as Lt. Gen. Benny Gantz steps down as IDF Chief of Staff, and will be replaced by Maj. Gen. Gadi Eizenkot. 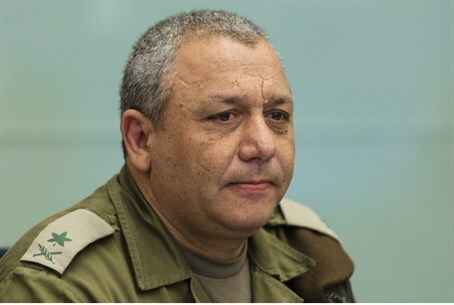 Prime Minister Binyamin Netanyahu and Defense Minister Moshe Ya'alon will promote Eizenkot to Lt. Gen. as well during the ceremony, according to Channel 2, marking his term in office as the 21st IDF Chief of Staff, during a Monday morning meeting in the Prime Minister's office in Jerusalem. Following the ceremony, Eizenkot and Gantz will stop at the Western Wall (Kotel) Plaza for a short joint prayer session, then travel to President Reuven Rivlin's Jerusalem home for an official reception and lunch. There, Eizenkot will also receive formal approval from the government for his promotion. Monday afternoon, Gantz, Eizenkot and Ya'alon will also travel to the Kirya IDF offices in Tel Aviv, where he will formally be appointed the IDF Chief of Staff under the direct supervision of the Defense Minister and in a formal ceremony. Eizenkot will only fully take his post once he is accepted by an honor guard; a toast will follow, whereby Gantz will then leave the base in his uniform for the last time. Eizenkot will finish off the evening by holding the first General Staff meeting under his tenure. Eizenkot, 54, has served over the past two years as Deputy Chief of Staff. He was originally assigned to the Golani Brigade, which he himself eventually commanded from 1997 to 1998. In 1999 Eizenkot was selected to be the Military Secretary for the Prime Minister and the Minister of Defense under then Prime Minister Ehud Barak. He later commanded the 366th Division and the Judea and Samaria Division. He was promoted to head of Israeli Operations Directorate in June 2005. In October 2006, Eizenkot became head of the Northern Command, replacing Maj. Gen. Udi Adam, who resigned amid criticism over his conduct in the Second Lebanon War. Eizenkot is married and a father to five children.